A modern, light-filled apartment with gorgeous terrace in a secure doorman building, Tabasco Terrace is the perfect La Roma haven for exploring CDMX. Hit the streets for internationally-renowned entertainment, shops, and culture, and then recharge with relaxing city views on Tabasco Terrace. Equipped with every comfort you enjoy at home. 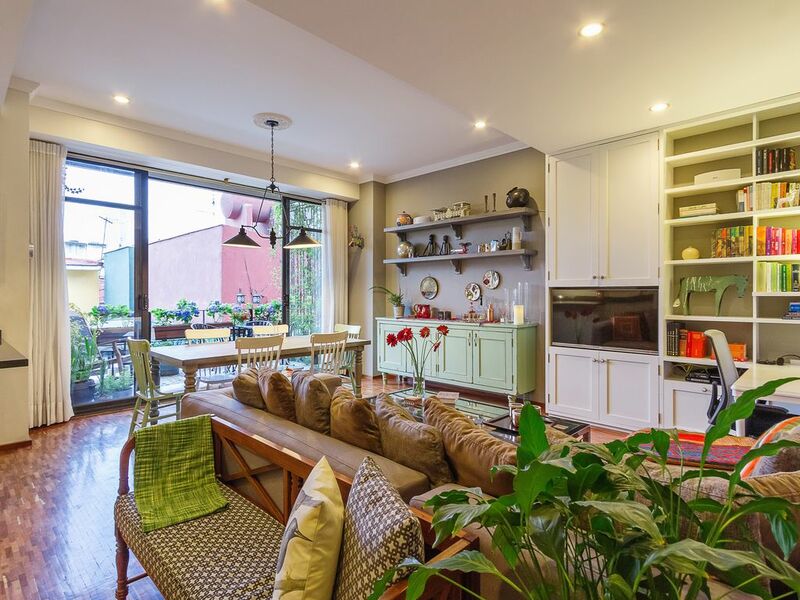 On a quiet tree-lined street in the heart of Roma Norte, this hip, modern apartment offers an oasis in the middle of the city. After a day of exploring cool and cosmopolitan CDMX, you’ll find relaxation, quiet, and comfort in this modern, plant-and-light-filled getaway. Historic plazas, word-class museums, and restaurants for every budget lie just outside your door. Complimentary parking makes getting around effortless. Take your morning coffee and meals on the spacious, lovely terrace—our concierge can stock the fully-equipped kitchen before you arrive, and our app makes communication easy. Relax in front of the 2 flat screen TVs, enjoy the WiFi, and sink into hotel-quality mattresses and linens in the 2 bedrooms, complete with en suite baths and luxury amenities. - Help finding a bus, calling a taxi, or renting a car. - Directions to affordable, authentic local cuisine at restaurants and cocina economicas. - Guidance on the coolest neighborhood coffee shops, hippest bars, and local hidden gems that make Mexico City a world-renowned destination. 6. An additional refundable pet deposit of $300 USD will be collected at the time of booking. Very comfortable, well equipped and well located appartment. Fairly quiet and very secure building. We stayed here for 4 nights and really loved it. The large open doors to the terrace made the experience amazing. The apartment is well appointed and is convenient to so much of the city's great areas. The large sofa was so great to relax on after a day of sightseeing. We would definitely stay here again. Location was great! Apartment was cute and comfortable. We would come back. The flat was lovely was well-equipped with everything you need, in a great part of town that made walking everywhere easy. In particular we appreciated the smart TVs, so we could continue our Netflix addiction while on vacation. We’d love to stay there again the next time we are in Mexico City! Tito the doorman was delightful and so helpful. I recommend this flat to anyone wanting a nice set up that allows for cooking and quiet sleep/rest but is also close to many cafes and attractions.